Event flags, teardrop flags. Ideal for all types of outdoor or indoor displays and events, the distinctive shape makes it stand out from the crowd. The flags are produced from high quality knitted polyester fabric and printed using the latest print machines to give a striking, vibrant print even on the mirror reverse side. The kit comes complete and ready for use with a ground spike and carry bag, optional bases are also available. Our teardrop flags are available in 4 different sizes and are packed full of features including a sectional pole for easy transportation. 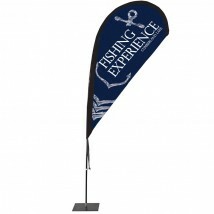 The pole also has 360 degree rotation, ideal for displaying the high quality printed flag. The teardrop system is supplied with a ground stake and carry bag with optional base extras available. The flag itself can be printed single sided or double sided. Turnaround times for custom printed teardrop flags are around 5-7 days and are printed in-house to ensure quality results. 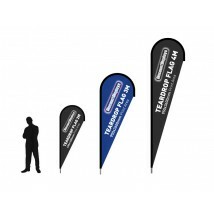 View our full range of custom printed flags for more options. You may also be interested in our range of event flagpoles, pop up tents, mesh banners, lampost banners, outdoor event signs, banner frames and PVC banners.